Rustic Farmer's Bread - Let the Baking Begin! This Farmer’s Rustic Bread Recipe is the best Homemade Bread. Easy Bread Recipe with a golden crackly crust and a chewy crumb, made with just a few basic ingredients. 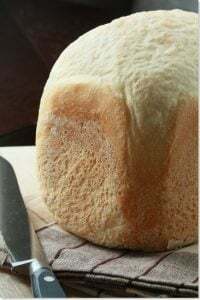 If you enjoyed this Bread Recipe, try our Bread Recipe for Bread Maker. 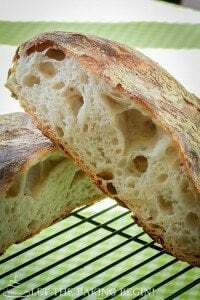 Searching for an Easy Bread Recipe I came across this recipe for Ciabatta Bread by Brown Eyed Baker. Having tried and failed at making Ciabatta bread before, this recipe looked especially appealing since it was pretty straightforward. Large holes, chewy crumb, and a golden crust made it impossible to resist wanting to make it. Quickly tossing together the ingredients for the sponge to proof overnight, this simple step gave me trouble. Stirring the called amount of flour and liquid was next to impossible. So I added 1/4 cup more water than what it called for, stirred, covered it and let it rest overnight. In the morning, I got my dough out, added the rest of called ingredients and once more, my dough looked nothing like the pictures in the above-mentioned recipe. I was afraid my mixer was going to break, it was struggling so hard. So I added 1/3 cup more water than what the recipe said. After continually following the instructions, my bread was still not looking like it should be. Giving up, I just let it proof until it doubled in size. Then I split my dough, folded it several times, divided it, shaped it onto ciabatta loaves and let them proof. The end result was not Ciabatta-bread-like, but definitely, like the Rustic Bread from the Portland Bakery, I buy all the time. 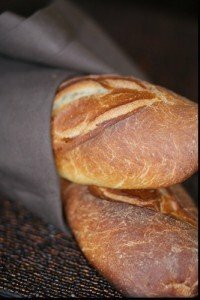 With just a few simple ingredients this Easy Bread Recipe turned out delicious! If you enjoy chewy Homemade Bread with crispy crust then this one is for you! Beware! The pictures below show a tripled batch. I recommend that if you go through the trouble you do the same, and freeze the bread you won’t eat right away until ready to eat. Toss flour, yeast, and water in a bowl of a mixer and stir together until it comes together. Cover the bowl and let sit at room temperature in a draft-free place (room temperature) 8 to 24 hours. Add flour, salt, yeast, water & milk to the risen sponge and fit the mixer with the paddle attachment. Combine everything on low speed, then continue mixing for a minute or two. When the dough comes together nicely, change to the hook attachment and knead the dough for about 20-30 minutes. As soon as the dough looks smooth and doesn’t stick turn off mixer. The 4th picture on the right is the dough during the mixing process, thus it looks rounder/firmer. Once the mixer stops, the dough flows and becomes flat. This is ok. The dough is meant to be very wet, which is what creates the chewy crumb. Cover the bowl with a towel or plastic wrap and let rise for 1 to 2 hours, until doubled in size. Notice that the dough is not firm at all. Spray working space with non-stick spray, or spread with oil. “Pour” the dough out onto working space. With a greased spatula or hands fold the dough over itself on all sides. Do this one more time, folding all four sides. This is very important: This is what gives the bread it’s shape. As you fold, the gluten is stretched and helps the bread to hold shape during the final folding. Leave the dough on the counter to rise for 30 minutes, covered with a towel. Spread it out into a 10×6 rectangle, then roll it tightly into a log. Press down with your fingers every one inch to flatten it if you want it to have the flat ciabatta look. If you want a regular loaf, do not press down with your fingers, just keep it log-round. One hour before baking, turn the oven to 450F and set the rack to the lower half of the oven. If you have a pizza stone or something similar set it on the rack and allow to preheat. Let the dough rise for 30 minutes, covered. Sprinkle the dough with flour. Sprinkle the loaf with a spray bottle and put it in the oven on the stone. Bake for 15 minutes or until the top is golden, then unpeel the foil and put the bread bottom side up and bake for an additional 10-15 minutes. Allow the bread to cool completely before cutting, about 1 hour. How long will this White Bread Recipe last? This Rustic Bread Recipe can be stored at room temperature, wrapped in plastic or in a Ziploc bag. It can last up to 3 days, or refrigerated for up to 1 month if double wrapped in plastic and then 1 layer of foil. To re-crisp, put the Homemade Bead in a 450F oven for 5-7 minutes. Rustic Baguette Recipe – Long, crispy baguette recipe. Artisan No-Knead Bread – Simple bread recipe with no-knead! Golden Buttery Sesame Burger Buns – Delicious homemade burger buns. Add flour, salt, yeast, water (start with ⅔ cup water and add a ⅓ cup more if the dough is not runny) & milk to the risen sponge and fit the mixer with the paddle attachment. Combine everything on low speed, then continue mixing for a minute or two. When the dough has come together nicely, change to the hook attachment and knead the dough for about 20-30 minutes. As soon as the dough looks smooth and doesn’t stick to the sides of the mixer stop (this might take longer or shorter depending on your flour). Cover the bowl with a clean kitchen towel or with plastic wrap and let rise for 1 to 2 hours (depends on how warm the room is) until doubled in size. Spray your working surface with nonstick spray or spread 1-2 tablespoons oil. ‘Pour’ the dough out onto a working surface, then with a greased spatula fold the right side of the dough onto itself, then the left side, the side closer to your onto itself, then the side away from you onto itself. Repeat the folding 4 sides one more time. Leave the dough on the counter to rise for 30 minutes, covered with paper or cloth towel. If working with only one batch, then split the dough in two (I tripled the recipe, so I had 6). Spread it out into a 10x6 rectangle, then roll it tightly into a log. Press down with your fingers every one inch to flatten it if you want it to have the flat ciabatta look. If you want a regular loaf, do not press down with your fingers, just keep it round. About 1 hour before baking, turn oven to 450F and set the rack to the lower half of the oven. If you have a pizza stone or something similar set it on the rack and allow to preheat. Let the dough rise for 30 minutes, covered. Sprinkle the dough with flour (optional). Bake for 15 minutes or until the top is somewhat golden, then unpeel the foil and put the bread bottom side up and bake for another 10-15 minutes (or until the bottom is golden). Allow the bread to cool completely before cutting, about 1 hour. This bread can be stored at room temperature, wrapped in plastic or put in a zip-lock bag, for up to 3 days, or refrigerated for up to 1 month if double wrapped in plastic and then 1 layer of foil. To re-crisp, the bread put it in a 450 oven for 5-7 minutes. To re-crisp the bread, put it in a 450 oven for 5-7 minutes. 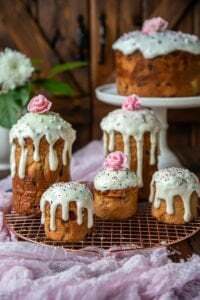 I tried this recipe and got an overall good result, but the instructions were honestly quite unclear and the process caused me a lot of frustration. I hope you can help me with a few questions I have about this recipe. First, when you say room temperature, what exactly do you mean, since climate and weather can cause these to vary. Second is the moister content of the dough, I understand a good bread dough is meant to be wet, but in the first step of making the dough it says to kneed until it is smooth and does not stick to the sides, which I can only assume means forming into a ball around the dough hook, like other bread recipes. However, I used the lowest amount of liquid (the sponge, 2/3 cup of water and 1/3 cup of milk) and the dough was so runny it always stuck to the sides. The wording on some of the steps could have been better as well, such as the folding, saying it had to rest for 30 minutes twice near the end, as it was honestly hard to follow when going through one step after another. Thank you for this nice recipe, I appreciate any feedback you can give and hope it answers questions for others who had trouble. Trying to decide to bake the bread, but can I bake it using “convection ” bake ???? Yes you can, I think the convection setting heats even higher than regular, which works ever better for bread. Yes you can, I think the convection setting heats even higher than regular, which works even better for bread. Where did the foil come in on this recipe? Hello Marina! My name is Vita! Made the sponge today want to try this recipe of yours, we all love bread! Do u oil the foil? It will not stick to the foil if I don’t oil? And u sprinkle with water? You’re right, if you oil the foil or even use parchment paper, the bread will not stick. Although, even without oiling it, it didn’t stick too mich. The water is sprinkled on the bread to create steam inside the oven, which helps the bread form a good crust. Bread Recipe for Bread Maker - Let the Baking Begin! 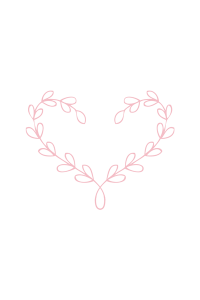 I’m happy that you had success! Bread is not for the faint at heart and you did it!! In the baking instructions you say peel the foil off. I don’t see any place where you wrap it in foil. I’m confused. Once you divide and shape the dough, you place it on foil and let it rise. Then you transfer the dough with the foil attached to it onto a baking stone or baking sheet. So, once the top is browned, you unpeel the foil and put the bread loaf upside down to brown the bottom side. Does that make sense? We recently baked a Greek lagana (which is a similar flatbread served here in Greece during Lent) but your ciabatta and your loafs look truly fantastic. Yes the starter dough is called a sponge 🙂 Thanks so much for your comment Mirella & Panos! Bread is excellent and easy to make. It says to cut into 2, is that because it makes 2 loaves or are they going to go back together at some point? Do I need to oil the tin foil? What does “roll like a jelly roll mean? Why flour the top and then spray with water? Hey! This recipe looks great! Little complicated, but great. I’ve made bread before with all different recipes. I want to make this recipe but saw you have a kitchen aid to mix it. I have one as well but we currently moved and I don’t have acces to it right now. Can I mix by hand, or with an electric mixer? What are your thoughts. Thx! To be honest, I’m not sure how it would work if you mixed it by hand since the dough is very runny, and it would probably be very difficult to mix. I can’t tell you how much this bread makes my mouth water just looking at it! I gotta try this recipe ASAP! Thanks for sharing! There’s nothing like making your own bread, hope you enjoy it once you do! We made this bread and we did have some issues with the amount of flour. It involves quite a few steps but……….it is delicious!!!!!!!! We thought it was too complicated but now that we tasted it, I guess we will be doing it again after all. Thanks for sharing. Here in US we have measuring spoons with spoons that say “1/8” of a spoon, or 1/3 of a cup. I’m guessing you’re not from here and that is why it doesn’t make sense. I wonder what speed some of these ladies had their mixers at. I had my KitchenAid set at a 4 and the dough looked exactly like you pictured it! Question. Can I freeze the dough and cook later? Would I have to let it rise again? I took your advice and tripled the batch, but I don’t want to be stuck around the oven all day. I would not recommend freezing as it will not rise as high. It’s better to bake all the bread and freeze the baked bread instead. I tried making this 2 x and never could get it to rise…. I guess it just isn’t a good one for me to start with 🙁 I have a kitchen aid I left it on with the dough hook for an hour and it never did pull away from the bowl… Once it started to rise, then fell and started to bubble…. A Pinterest fail. When you say that it never pulled away from the bowl what do you mean? it isn’t supposed to completely come off the bowl in one ball, but the sides of the bowl should start to look clean where it used to stick, is this how it was? If that is how it was, then that is all you need. How long did you leave it to rise before it started to fall? Was your dough the consistency it shows on the picture when you were done mixing it? Working with wet dough is very challenging at first because we’ve always been told to knead and handle our dough. Wet dough is extremely fragile and takes a very light touch. If you try to handle it roughly as you would with a more traditional less wet dough, you WILL fail. Touch it as little as possible, only enough to shape it, add as little flour as necessary, put the temp up to where Marina has restated it, and you will be successful! Nothing store bought will even come close to what you’ve prepared. with this recipe initially when you use the mixer or the bread maker to knead the dough, you need to really knead it and handle it until it becomes stretchy and doesn’t stick to the sides of the bowl. Once it is knead, and you’re shaping the bread before it goes in the oven, you’re right, you need to be very gentle with it, as not to disturb the air bubbles that are already in there. I only bake this fresh bread for my family now (vs buying in store) and they love it. It’s so easy. I did run into the same water to flour ratio problem you did. I only use 5 cups flour to 3 cups water and spend 2 mins mixing it by hand. I found the best technique is to mix the yeast, salt and water then gently distribute all the flour on top of the water. Then I use my hand to swirl the flour into the water from the middle out…kinda like making pasta…if that makes any sense. I like that I can make smaller loaves (or big ones if i want) and I only have to do the prep once a week or so. My kiddos like a softer crust so I skip the water step, but it still turns out fabulous. what about the aluminum foil?? it is in the pictures but not in instructions. Yes, I was also wondering about that. I baked the bread at 350F for half an hour and it came our white i.e. had no colour to it and so I was wondering if the tinfoil was needed to give it colour? Perhaps the baking temp is too low? The original post referred to in Marina’s post says to bake at 450F? So I’m also looking forward to clarification…. The tinfoil really doesn’t do anything except help with cleanup, but the temperature was too low 🙁 I baked it at 350 after posting the recipe and had the same thing, so yes, you should increase it to 450 for proper crust and color formation. I already changed it in the recipe. I just baked mine and it’s very flat, unappealing, and has zero color on it. Grr! I’m super frustrated with making bread! Except Amish Friendship Bread, I’ve got that down pat. The dough is supposed to be very sticky and runny. If you look on my pictures you will see that when I pour it out of my bowl onto the working surface it almost goes flat, cuz it’s so runny. The high water to flour ratio is what gives the bread the chewy crumb (like ciabatta would have). I do want you to know though, different flour (brands) will take up different amounts of liquid and will make for different types of textures of the bread. When following the recipe myself (from the source mentioned in the text), I found that when I added the amount of water the author called for, my dough was much firmer then what hers looked like on the pictures, so I added more water. It might be the case that with your flour, or your air humidity, so in your situation you need to add either less water or more flour. Check out the original recipe and see how much water she adds, and what her dough looks like. That might help. At the end of the kneading cycle, the dough is extremely sticky, you definitely can’t take it out of the bowl with your hands, without getting them all stuck to the dough. That is what its supposed to be. When the mixer kneads it, it will start out sticking to the bowl a lot, but as the gluten develops, the dough will stop leaving the bowl stuck up with dough. So even though the dough is sticky, the edges of the bowl will be ‘clean’ like you can see on the picture. Another thing – if your yeast has been sitting in the cupboard for too long, it might not be very active anymore, thus not rising your dough enough, and giving you the ‘stodgy” & “heavy” feel to it. There’s a few variables that can be affecting the outcome of the bread, so I hope you guys find what it is and are able to make this recipe into a successful loaf of bread. Kim, I’d swear you were in my kitchen right now! I have had the same exact problems! My dough looked like cake batter it was so thin. Sadly, I was forced to add more flour so I know it’s going to be pretty dense. I’ve got about 3 minutes left and there is ZERO color on my bread. I think I’ll oil wash it and try again. 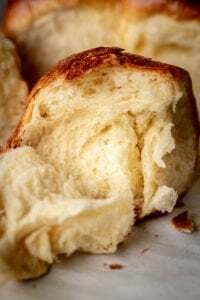 I hope you had a minute to read my response to Kim, as I described what the dough looks like at the end of the kneading cycle and as I mentioned, it is supposed to be very sticky – that is what produces that chewyness in the bread. But towards the end of the kneading cycle, you will see that the sides of the bowl will be clean (meaning that the dough no longer sticks like it did in the beggining) as the dough is spun around. This does not at all mean that you will be able to remove the dough from the bowl and it will not stick to your hands (it WILL stick to your hands a lot). As far as the color, anytime you bake, it will usually say “bake for X amount of time, or until golden in color”, so if the bread was not golden or brownish towards the end, it just means that you need to leave it in the oven longer. It can also mean that the temperature in your oven is not what you set it to. For example, some ovens you set them to 350F, but if you actually check the temp with thermometer it will be only 320F. I am going to try this later today. My family (my husband), really enjoy this type do bread. Looks straight forward and easy to follow. This bread is wonderful! Your family will enjoy it! Some seriously gorgeous look bread, Marina and very cute painted finger nails! Love it! Your photos are stunning…I don’t make bread all that often, but when I do, I always choose a rustic loaf like this.